The identification of Jebus with Jerusalem has been disputed, principally by Niels Peter Lemche. Supporting his case, every non-biblical mention of Jerusalem found in the ancient Near East refers to the city as ‘Jerusalem’. An example of these records are the Amarna letters, several of which were written by the chieftain of Jerusalem Abdi-Heba and call Jerusalem either Urusalim (URU ú-ru-sa-lim) or Urušalim (URU ú-ru-ša10-lim) (1330s BCE). Also in the Amarna letters, it is called Beth-Shalem, the house of Shalem. The Sumero-Akkadian name for Jerusalem, uru-salim, is variously etymologised to mean “foundation of [or: by] the god Shalim“: from Hebrew/Semitic yry, ‘to found, to lay a cornerstone’, and Shalim, the Canaanite god of the setting sun and the nether world, as well as of health and perfection. Theophilus G. Pinches has noted a reference to “Yabusu”, which he interpreted as an old form of Jebus, on a contract tablet that dates from 2200 BCE. The Hebrew Bible contains the only surviving ancient text known to use the term Jebusite to describe the pre-Israelite inhabitants of Jerusalem; according to the Table of Nations at Genesis 10, the Jebusites are identified as a Canaanite tribe, which is listed in third place among the Canaanite groups, between the biblical Hittites and the Amorites. Prior to modern archaeological studies, most biblical scholars held the opinion that the Jebusites were identical to the Hittites, which continues to be the case, though less so. However, an increasingly popular view, first put forward by Edward Lipinski, professor of Oriental and Slavonic studies at the Catholic University of Leuven, is that the Jebusites were most likely an Amorite tribe; Lipinski identified them with the group referred to as Yabusi’um in a cuneiform letter found in the archive of Mari, Syria. As Lipinski noted, however, it is entirely possible that more than one clan or tribe bore similar names, and thus that the Jebusites and Yabusi’um may have been separate people altogether. In the Amarna letters, mention is made that the contemporaneous king of Jerusalem was named Abdi-Heba, which is a theophoric name invoking a Hurrian mother goddess named Hebat. This implies that the Jebusites were Hurrians themselves, were heavily influenced by Hurrian culture, or were dominated by a Hurrian maryannuclass (i.e., a Hurrian warrior-class elite). Moreover, the last Jebusite king of Jerusalem, Araunah/Awarna/Arawna (or Ornan), bore a name generally understood as based on the Hurrian honorific ewir. Richard Hess (1997:34–6) points to four Hurrian names in the Bible’s Conquest narrative: Piram (king of Jarmuth) and Hoham (king of Hebron) (Jos 10:3), Sheshai and Talmai, sons of Anak (Jos 15:14) with Hurrian-based names. The Hebrew Bible describes the Jebusites as dwelling in the mountains besides Jerusalem. In Exodus, the ‘good and large land, flowing with milk and honey’ which was promised to Moses as the future home of the oppressed Hebrew people included the land of the Jebusites. According to the Book of Joshua, Adonizedek led a confederation of Jebusites, and the tribes from the neighbouring cities of Jarmut, Lachish, Eglon and Hebron against Joshua, but was soundly defeated and killed. However, Joshua 15:63 states that Judah could not dislodge the Jebusites, who were living in Jerusalem (“to this day the Jebusites live there with the people of Judah”). Judges 1:21 portrays the Jebusites as continuing to dwell at Jerusalem, within the territory otherwise occupied by the Tribe of Benjamin. Certain modern archaeologists now believe that the conquest of Canaan by the Israelites under Joshua simply didn’t happen, and that the Israelites actually originated as a subculture in Canaanite society. Some biblical scholars believe that the accounts in the Book of Joshua are cobbled together from folk memory of disconnected battles, with numerous different aggressors, which occurred over a time period of over 200 years. According to the Second Book of Samuel, the Jebusites still had control of Jerusalem at the time of King David, but David wished to take control of the city. Understandably the Jebusites contested his attempt to do this, and since Jebus was the strongest fortress in Canaan they gloated that even the blind and lame could withstand David’s siege. According to the version of the story in the Masoretic Text, David managed to conquer the city by a surprise attack, led by Joab, through the water supply tunnels (Jerusalem has no natural water supply except for the Gihon Spring). Ever since its discovery in the 19th century, Warren’s Shaft, part of a system which connects the spring to the city, has been cited as evidence for the plausibility of such a line of attack; however, the discovery, at the turn of the 21st century, of a set of heavy fortifications, including towers, around the base of the Warren’s Shaft system and the spring, has made archaeologists now regard this line of attack as implausible, as it would be an attack against one of the most heavily fortified parts, and hardly a surprise. The account in 1 Chronicles mentions the advantage of a speedy attack but does not mention use of the water shafts  and according to many textual scholars[who?] the claim in the Masoretic Text could simply be a scribal error; the Septuagint version of the passage states that the Israelites had to attack the Jebusites with their dagger[s] rather than through the water shaft. According to the “Jebusite Hypothesis,” however, the Jebusites persisted as inhabitants of Jerusalem and comprised an important faction in the Kingdom of Judah, including such notables as Zadok the priest, Nathan the prophet, and Bathsheba, the queen and mother of the next monarch, Solomon. According to this hypothesis, after the disgrace of a rival Elide faction of priests in the struggle for succession to David, the family of Zadok became the sole authorized Jerusalem clergy, so that a Jebusite family monopolized the Jerusalem clergy for many centuries before becoming sufficiently attenuated to be indistinguishable from other Judeans or Judahites. The First Book of Chronicles states that the inhabitants of Jebus forbade King David from coming to Jerusalem shortly after he was made king. Joab went up first and took the city and became chief and captain of David’s armed forces. Jerusalem is referred to as Salem rather than Jebus in the passages of Genesis describing Melchizedek. According to Genesis, the ruler of Salem in the time of Abraham was Melchizedek (also Melchizedeq), and that as well as being a ruler, he was also a priest. The Mediæval French Rabbi Rashi believed that Melchizedek was another name for Shem, son of Noah, despite Abraham’s supposed descent from the line of Shem’s son Arphaxad. Later, Joshua is described as defeating a Jebusite king named Adonizedek. The first parts of their names mean king and lord, respectively, but though the zedek part can be translated as righteous (making the names my king is righteous and my lord is righteous), most biblical scholars believe that it is a reference to a deity named Sydyk or Zedek, who was the main deity worshipped by the Jebusites (making the names my king is Zedek and my lord is Zedek). Scholars are uncertain, however, whether Melchizedek was himself intended in the Genesis account to be understood as a Jebusite, rather than a member of another group in charge of Jerusalem prior to the Jebusites. Some scholars have speculated that as Zadok (also Zadoq) does not appear in the text of Samuel until after the conquest of Jerusalem, he was actually a Jebusite priest co-opted into the Israelite state religion. Frank Moore Cross, professor at the Harvard Divinity School, refers to this theory as the “Jebusite Hypothesis,” criticizes it extensively, but terms it the dominant view among contemporary scholars, in Canaanite Myth and Hebrew Epic: Essays in the History of the Religion of Israel. 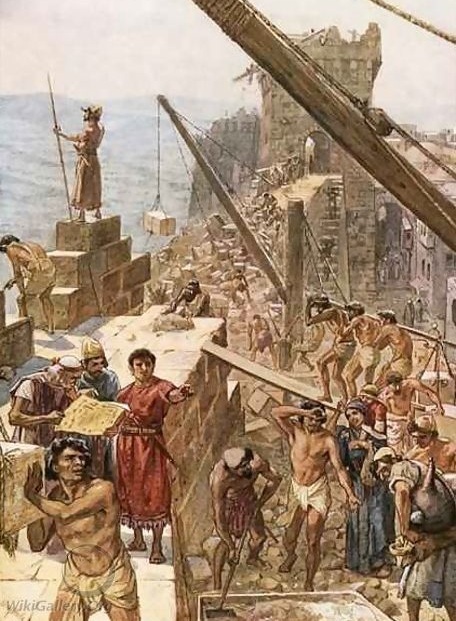 According to classical rabbinical literature, the Jebusites derived their name from the city of Jebus, the ancient Jerusalem, which they inhabited. These rabbinical sources also argued that as part of the price of Abraham’s purchase of the Cave of the Patriarchs (Cave of Machpelah), which lay in the territory of the Jebusites, the Jebusites made Abraham grant them a covenant that his descendants would not take control of Jebus against the will of the Jebusites, and then the Jebusites engraved the covenant into bronze; the sources state that the presence of the bronze statues are why the Israelites were not able to conquer the city during Joshua’s campaign.